The model is a Casio AE-1200WHD-1AVEF iluminator, which a few of us on the forum have. Is the front plastic or glass? He's scratched it at school. I might be able to polish it out if it's plastic. Thanks. By the simple expedient of typing it into Google it appears that it is acrylic glass i.e plastic. If it’s acrylic plastic (likely) the standard procedure for refinishing should suffice. Ideally, 1500 grit wet and dry, followed by 3000, followed by autosol metal polish, will fix it. Finishing with polywatch will get it sparkling, but for this type of watch the finish with metal polish will probably look OK.
Wrap the wet and dry paper around something flat, a hard rubber block is ideal, or a lolly stick. Doing it like this will improve the levelling effect, it’s a more efficient way to do it. My rubber blocks are made from offcuts of a car exhaust mounting, it’s hard rubber and it’s flat. Finer wet and dry is available, but 3000 followed by metal polish works well. Use the paper wet, and put a spot of detergent in the water. Washing up liquid’s fine. Don’t attack it with a Dremel, using the polishing mops with polish will almost certainly melt the surface! Thanks Paul that's great advice I've ordered some Polywatch. He's only 12 and is upset he's marked it as I bought it for him recently. Polywatch is OK for final finish, otherwise it’s like boring through a mountain with a carrot. It’ll improve the scratch by softening the edges slightly, but that’s all. If you make the scratch disappear the lad will think you’re a genius! It happens to the best of us.......scratched the acrylic crystal on my 1952 Seamaster yesterday and had to give it the treatment! 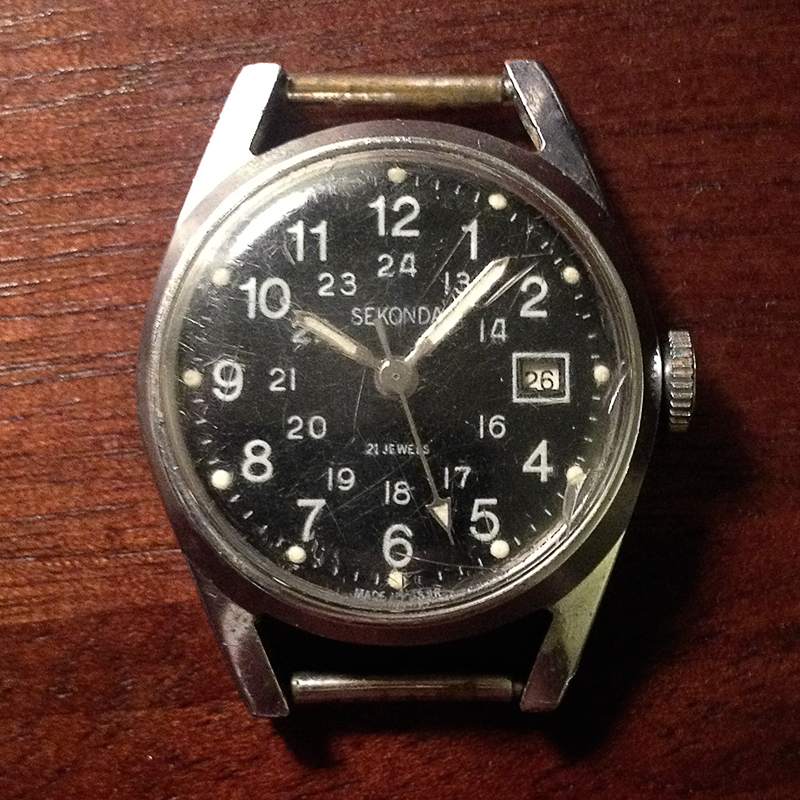 I gave my then 12 year old son a gw-5610bc out of my (too large) Casio collection and within a few months the clasp was through to the metal, the bezel was heavily gouged and it looked like it had been run over by a train! - still worked perfectly of course. Moral of the story? Kids = g shocks! It's not just kids.. There must be a gene in the human species that makes them ignore "that thing on their wrist". My wife is terrible - she had a lovely slim and beautiful Skagen for a few months before one day and I saw scratches/chips etc that all over it - two days later she had cracked the crystal (albeit acrylic) in half. Now, if she was on a building site using it as a tool I could understand that, but she drove a desk at the time!! Whereas all of my watches are worn for work (Used to be a fairly manual job too) and bar the odd ding or scratch they are all fine and dandy some of which I have had long past 18 years... Shame she isn't into G-Shocks. Hope the lad gets some good fixing skills and as others said gets more of a sense of ownership of the watch. While it's not nice to break/damage things I do love the fact that, generally, I have been able to fix them afterwards - my kids notice it a lot to, many a time I hear a "Daddy, can you fix this?". Good to hear, time to go rummaging in the garage for some sandpaper. Do you get invited to many parties Henk?